From February 19 until May 30 2013, took place in Thessaloniki, in the Science Center and Technology Museum NOESIS, the exhibition Aegean, the birth of an Archipelago, in which the genesis and the geological evolution of the Aegean Sea were presented. 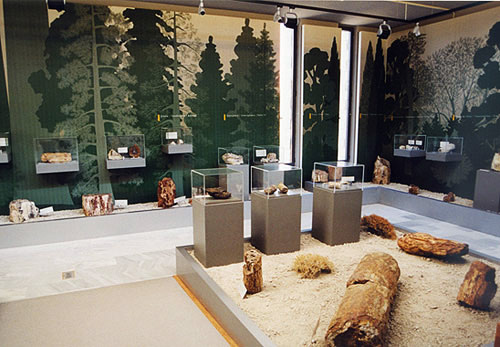 The exhibition is organized by the Natural History Museum of Lesvos Petrified Forest in collaboration with the Museum of Paleontology and Geology of the Aristotelian University of Thessaloniki. The scientific supervision is of the Associate Professor in the Aegean University and director of the Museum of Lesvos Nick Zouros. The exhibition spreads to over 850 sq m and consists of three sections with significant exhibits, photographs, virtual and audiovisual material explaining how the archipelago was created and the evolution of life in the marine environment, coasts and islands. The first section presents the geological history of the region beginning from the Sea of Tethys, which covered a large area of land millions of years before the geological upheavals brought to the surface Αegaeis , which in its turn submerged leaving the space for the Aegean Sea. The most important exhibit is a petrified trunk which has a length of 12 meters, possibly of an oak-tree, found in Eressos on Lesbos. It is 18.5 million years of age. The second section presents the evolution during the long process of eruptions of the volcanoes in the Aegean sea . Of particular interest are two pieces of stone volcanic ash with fossilized tree leaves. • The one is from Sigri of Lesvos with leaves of the trees existed in the tropical forest of the Aegean Sea, covered by volcanic ash 18.5 million years ago. • The other is from Santorini with leaves of an olive-tree 60,000 years ago. • Fossilized pieces of trunks from secuoia, the tall tree known from Oregon and California in USA, existed before 20 million years in Lesvos. Also, residues from palm, cinnamon and kounichania, a tree that grows in subtropical climates today. • Fossils of animals that lived from 9 to 16 million years. Like a giraffe with a short neck from Chios, an antelope skull from Samos, a dwarf elephant from Telos and more. • Ammonites, a kind of shellfish found in Chios that lived in the Sea of Tethys 245 million years ago. Three casts of skulls are also exposed showing the evolution of man; among them the cast of the skull of the famous man of Petralona found in the Cave of Petralona, in Chalkidiki.